Kollage needles are in my opinion the best there are. Without a doubt, regardless of the fiber I'm knitting with at the time, these are spectacular. I will caution those not familiar with Kollage to take the time beforehand to knit a swatch to ensure the gauge is correct. One of the things I like about Kollage needles, too, is the stitches come out very even and this does make for a real pretty finished knitted piece. 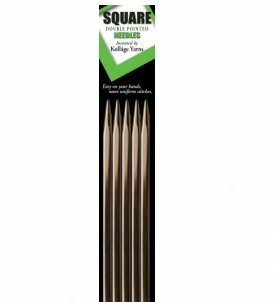 the square needles make knitting fun. Easy on the hands and to keep stitches on the needles.